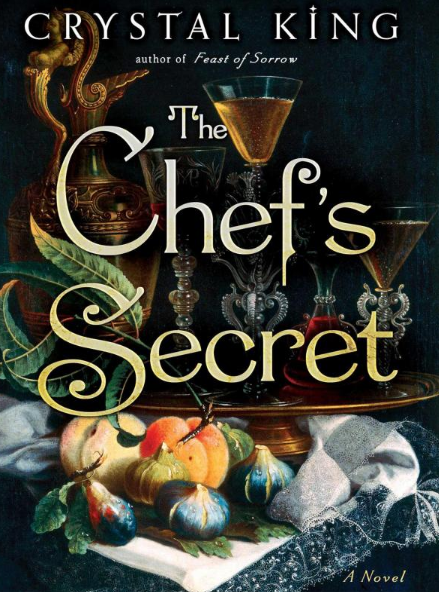 Set in 16th century Italy, The Chef’s Secret by Crystal King follows papal chef Bartolomeo Scappi and his apprentice, Giovanni, through two intersecting tales that peel back like layers of an onion. While Scappi was indeed the chef of a Pope, King notes that not much is known about him save his recipe book, and so she has filled in quite a few blanks in his life. And a colorful life she has made it. Through a series of coded journals, Giovanni learns secrets about Scappi’s life as a young man and his rise through the ranks to become chef to the Pope. The reader soon comes to find that the chef does not just have one secret, but many. Giovanni must contend with the hard truths of what he learns from the journals, as Scappi’s life has come to impact his own in several ways. As should be expected from the title, King goes into delicious detail describing decadent desserts and ostentatious dinners featuring multiple courses. From sugar sculptures to pigeon pies, Scappi leaves his distinctive mark on Italian high society–and historically speaking, for years to come via his cook book. While I had knowledge of Renaissance Italy from Art History courses, I didn’t know much about the inner workings of the Vatican (save for customs in choosing a pope), or its kitchen and papal meals. While some popes languished in excess, both Scappi and Giovanni must reign back their talents in the kitchen for popes wishing to lead a simple life like Christ by eating only limited, unembellished foods. While King offers a trove of sumptuous detail, the reader only truly gets close to Scappi and Giovanni. The secondary characters are somewhat two dimensional and we aren’t really shown their inner workings or motivations aside from how Scappi and Giovanni perceive them. Although The Chef’s Secret follows an interesting subject, for some reason the stakes never seem that high and the novel largely plateaus as the reader often surmises what will happen next. The end was somewhat anticlimactic, but the novel as a whole is apt at emphasizing the danger of secrets, especially familial. The novel could have been enriched further with a stronger B or even C plot, as there is a similar base line that seems to be followed throughout which leaves the reader feeling a bit unfulfilled.